This event began when our Lady came into LADY’S IMAGE to buy a piece of the Blessings Collection – locally made jewelry – as a gift for a friend. While our Lady stood at the jewelry case, a second customer came into the store. Weeks earlier our second customer had put her bridal gown and accessories on layaway. She came in to say she had been laid-off and didn’t know how she was going to pay the balance of her layaway. Tears flowed. The bride-to-be was devastated. More tears flowed. It was very sad. Now our Bride really cried. Our staff was in tears as well as the other customers in the store. Our Lady who paid the bill had no idea what the balance was for the bride’s layaway. She only knew she wanted to give a gift of kindness. Tears of sadness became tears of joy. Hugs and thank yous were exchanged. 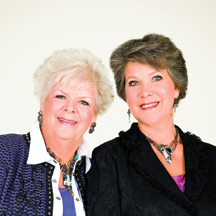 We at LADY’S IMAGE thank our Lady for her generosity and her gift. What an example she set, especially not wanting this story told. I share this only to be able to say LADY’S IMAGE customers are the BEST and I hope our LADY forgives me for sharing this little bit of joy with all of you. Every season we find new ways to seduce you. A few new collections: Simpli coordinates, Gail Garrison Couture for social occasions, and the Frank Lyman collection for the day into evening transition. We have also expanded our machine-wash Ming Wang knit collection to include sizes XS to 3X with oceans of exciting jackets and items to inspire you. LADY’S IMAGE has the must-haves that should walk off the runway and right into your closets. Oh, by the way, please friend us on Facebook. You will be glad you did! 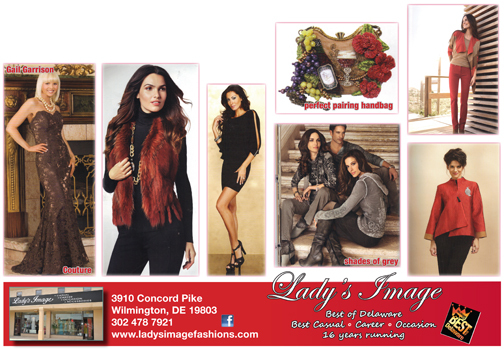 Come into LADYS IMAGE and discover why, for 16 years running, we have been voted by readers of Delaware Today magazine as Best of Delaware for Casual, Career, and Occasion fashions with accessories for all occasions. When you come to LADY’S IMAGE let us know if you are happy I shared this story with you.